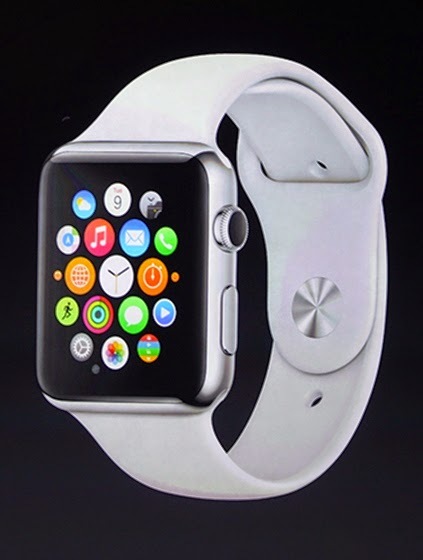 Apple also revealed its long awaited watch when they launched the iPhone 6 and iPhone 6 Plus yesterday. The Apple Watch retails at $349 and will have two other designs; the Apple Watch Sport and Apple Watch Edition (Price not yet available for these 2) and will be available early next year. The Apple Watch will require an iPhone 5 or later to function. The screen works much like a display on iPhones or iPads and can sense force. The back part of the watch can measure heart rate and has a wireless inductive changing mechanism. This is also where you attach the charger via a magnet. Moving your wrist activates the display of the watch. The device's functionality relies on the crown of the watch. You can change and customize the colors and themes. There's also the famous Siri which will answer your basic questions. The Apple Watch can also notify you with friend request on facebook and even reply to tweets. Cook said during the launch that the Apple Watch is the company's most personal product yet. It doesn't only come with technology but also with style. Fashionistas can change the watch straps to match their outfits of the day.